I’m not your biggest baker, so this is probably the only baked good you’ll see on here… other than my awesome scones which I am sure to make some time soon! 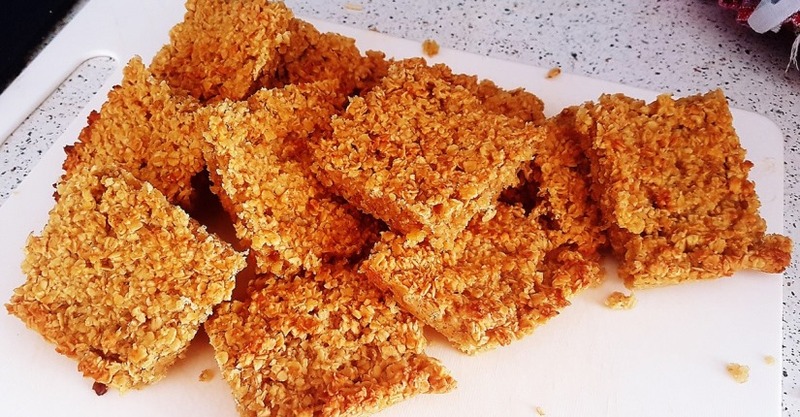 Not only is this flapjack the easiest snack on the planet, it’s pretty healthy (compared to your usual butter heavy, syrup soaked chucks of oaty awesomeness). Serves 1 very greedy person (makes about 12 squares). Put the spread and agave syrup into a saucepan and heat gently until the spread has melted. Stir in the oats until combined. Transfer into a baking tray lined with baking paper and spread out using the back of a spoon until mostly flat. Take out and cool, then cut into pieces. Devour before anyone else notices you’ve made them. Did you eat your flapjack all in one go, or did you share?